As some of you may already, Oz Soylent was selected to be one of the finalists of Simplot Ignite Scaleup Program. One of the important points we found out during our pitch was how unhealthy Australian lifestyle is. Sourced from the Pitango Lunch Survey, 41% of Australian working individual skip lunch at least once a week. Looking deeper, 10% of working Australian living in urban areas skip lunch at more than 3 times a week! The main reason, a whooping 76% of these people cited they’re simple too busy to have lunch. It is common knowledge that skipping breakfast can be detrimental to an individual’s productivity for the day as we get most of our day’s energy from breakfast. However lunch is also as important in keeping a healthy lifestyle. A recent study suggests people who take time to have lunch reduces stress and extends work productivity through the afternoon. 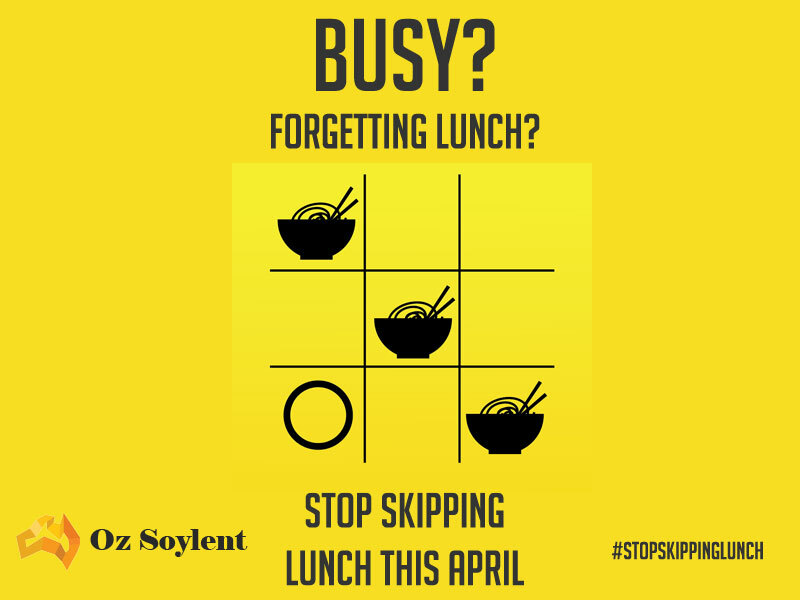 At Oz Soylent we think a healthy lunch is so important throughout April we’ll remind you how a nutritious lunch can power you through the day and have enough energy to enjoy the evening as well. We’ll also post some lunch cheat sheets over the month to inspire you to build a healthy lunch habit. To kickstart the campaign, Oz Soylent is offering a one time $10 off your purchase above $50. Just use the coupon code: stopskippinglunch. Stay tuned for creative lunch ideas this April!